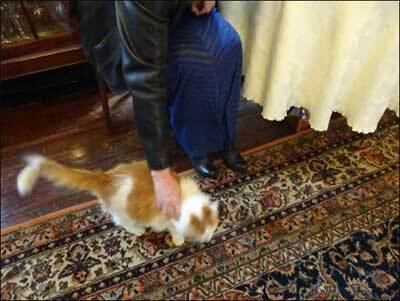 One of my duties at the House of the Seasons is to lead our guests on a tour of the house. In every room we visit, I weave in and out through the crowd of feet, maybe running against a leg or two, before showing off the best perch in the room. One of my other duties is to oversee breakfast. I stand guard and make sure everyone is enjoying their meal. Should anything fall to the floor, well, I make sure it’s cleaned up post haste. I take both of these duties seriously and I love interacting with our guests. I’ll happily accept a scratch behind the ears or a pet along my back as acknowledgement for a job well done, but please, leave my feet on the floor. I’m too mature and dignified to be picked up like a spring kitten. A lady has her limits, afterall.